Join Bangladesh Air Force as MODC (GD and Clerk). Bangladesh AirForce has published a job circular for the post of MODC (GD and Clerk). This job is only for the unmarried male candidates of Bangladeshi Citizens. Age must be within 16 to 21 years on October 18, 2015. In case of proving age affidavit is unacceptable. 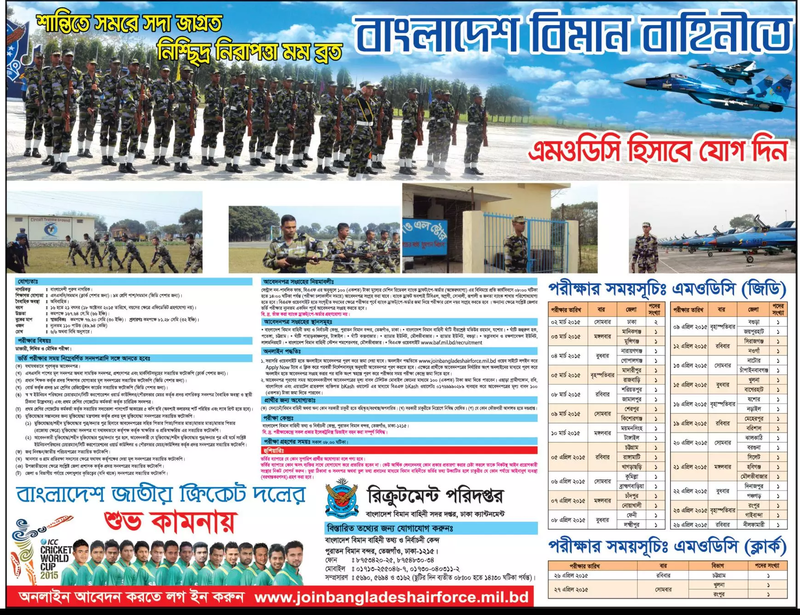 This is really a great opportunity for the job seeker male citizens of Bangladesh to join in the Job of Air Force. This will be a great glory for them to serve the country by joining Air Force. Hope this Air Force Job will change your life. For the post named MODC Clerk a candidate must be SSC or equivalent exam passed and for GD post one must have passed class Nine (09). You also must have the minimum physical fitness. Otherwise you will be rejected. It would be better to go through the below given job circular to know in details. Three type of exam will be held. At first a candidate will face the medical exam. If he is medically fit then he will face the written exam and after passing that exam finally he will face the viva-voce. After passing the viva exam finally he will be recruited for the MODC post as GD or Clerk in Bangladesh Air Force. Hope you got my point. You can apply through online and manually. If you want to apply through online then login to given web address and apply as directed in the job circular. By collecting application form from the below given different addresses a candidate can also apply. In that case just check that from where you can collect the application form with 100 Taka Bank Draft or Pay order. The exam will be held in Dhaka in different dates. Just check the address and dates. For MODC (GD) Post the exam will be held from March 02, 2015 to April 08, 2015. MODC Clerk exam will be held only in two days which are April, 26, 2015 and April 27, 2015. The dates are given below according to district wise. If you need further information then you can contact in the below given address and Mobile numbers. To get the update news of Join Bangladesh Air Force as MODC (GD and Clerk) and some other jobs and Results like our Facebook Fan Page facebook.com/allbdresults and Follow in Twitter. You can leave your comment or feedback in the comment section as those are great value for us. So try to the best to get the above mentioned job. « TSO Job Recruitment at Abul Khair Tobacco Company Ltd. I am very interested to join bdairforce, but I were power glass. How many power are demanded for join bdairforce. Please answer. It would be better to contact to Air Force Admission Authority Directly. They will give you the best answer. I want to join Bangladesh air force.How I am join Bangladesh air force?